After making up two batches of bread dough this morning, I settled into the usual routine of looking online at the job boards. That is a long drawn out process for me, where I am searching over 150 pages and it typically takes over three hours on a "slow day". Fridays are 150 pages plus the beginning of the weekly search is added in for yet another 200 pages of "fun". I was going through all this happiness and realized that things were beginning to slow down. Being a Project Manager, and having done more than my fair share of support on the desktop as well as large scale Financial Systems, I began to poke around. Ever wonder what's eating up all of your computer instead of just unplugging it and plugging it back in? 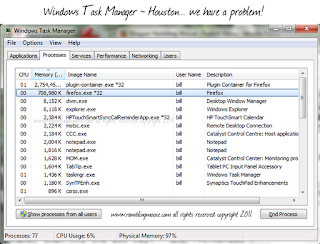 Ok, on Windows 7 (and the predecessors) there is something called "Windows Task Manager". It's not perfect, but it will give you some basic information. You can't really hurt anything with it and it can let you know why your browser is running slow. To get it to run is simple. Hold down the Left side Shift and Ctrl button with one hand, then hit the Esc key. "SHIFT+CTRL+ESC". A window will pop up that has the list of Applications that are running that you should know of just by looking at your PC. To find out the juicy stuff, look at the second tab called "Processes" by clicking on it. The Processes tab will have a list of all of the things that are running that you can see plus all of the things that you can't see. There are usually a few things that are behind the scenes and I won't go into them since for a "casual" user, it's probably over your head. This will suffice for the majority of people. 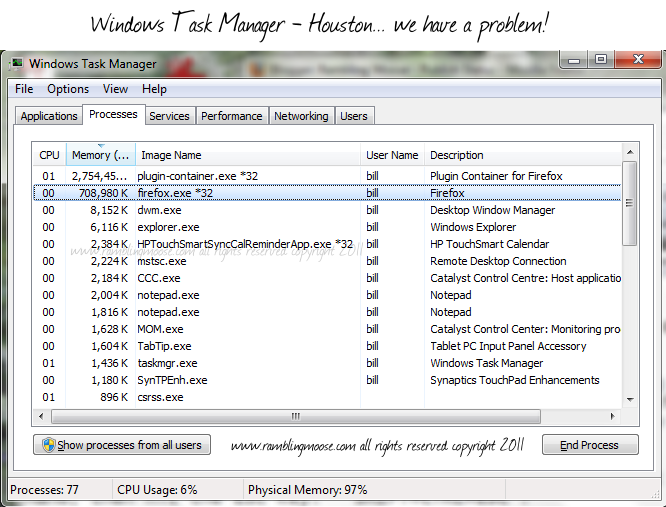 Each of those columns can be clicked on and the Task Manager will happily sort them in descending or ascending order. I usually have mine set to sort the Memory column descending. What that shows me is the really greedy programs out there. You can see from that list that the Plugin Container for Firefox has run amok. Steven Jobs was right about one thing, Adobe Flash is a minefield of problems for a computer and that will eventually crash after making Firefox unusable. Once it crashes, the browser will run normally until tomorrow when I start looking at more web pages. The other column that could be useful to sort is the CPU column. That's telling you just how much of your computer's processor is being used by a program at this time. If it's more than a couple percent, it bears watching. For a while, the plug in container was at 50 percent. In fact this has gone on for so long that I'm writing this blog posting in a word processor instead of in the usual web interface from Blogger. I'll have to restart the browser since I'm getting some real entertaining messages from Firefox warning me about scripts running amok. Yes, folks, even the support people have problems with crappy web pages. It's not just you. But at least now you have a way to diagnose some of the problems instead of being confused. It's ok to be confused too because we all get that way from time to time. Sigh... time for a "restart" I guess! Back later!